As a family practitioner in Wilson since 1993, Dr. Gregg Sigmon focuses on empowering patients to take control of their own health. He believes in being a partner–in–health for young and old. Interns and staff who work with Dr. Sigmon are impressed with his determination to help patients understand their conditions and all the elements that affect it. He is well–known for sharing information and using his own drawings and even cartoons to make that information clear. His attitude and commitment help motivate patients to tackle challenges like obesity, smoking, and dealing with diseases like diabetes every day. Armed with up–to–date medical knowledge and a compassionate sense of humor, Dr. Sigmon inspires patients of all ages to become as healthy as possible. Dr. Sigmon is a staff physian with Wilson Medical Center in Wilson. A diverse background may help explain his ability to be effective with so many people. Born in Louisville, Kentucky in 1949, his family soon moved to Greensboro, NC where he went to school and graduated in 1967. Moving on to Elon College, he received a Bachelor of Science in Chemistry and Biology. He also attended a community college and became a certified carpenter! He continued his medical education at Wake Forest University and practiced Family Medicine in Greenville, NC. 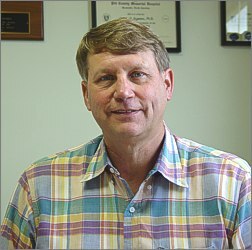 Dr. Sigmon received his specialty certification from the American Board of Family Practice in 1988. His own work experience ranges from a hospital orderly to a chemist quality supervisor and production supervisor at E.I. duPont deNemours before completing his medical education and becoming certified. Married with four children, two of each, he is experienced with the challenges of families. He enjoys following his children's interest in sports and music. Understanding the importance of balance in life, Dr. Sigmon is an avid train collector and a member of Train Collectors of America, Lionel Collectors Club of America and the Virginia Train Collectors Club. Professionally, he is a member of the Wilson Medical Society, American Academy of Family Physicians, the North Carolina Academy of Family Physicians and the North Carolina Medical Society of Family Physicians. Dr. Sigmon is happy to speak to fraternal clubs, school, church and community groups about health issues...or even model trains! Call the Wilson Family Practice Center with your speaker requests.